The nominations were announced yesterday for the 2019 Olivier Awards which are taking place on Sunday 7th April 2019, at the Royal Albert Hall. Cool off with the Classics . . . a blogathon consisting of a top 10 list of some classic black and white films. It didn’t really take very long for a few of the films to come straight to my mind for this list. I am not going to put them in any particular order, but 10 films are included. 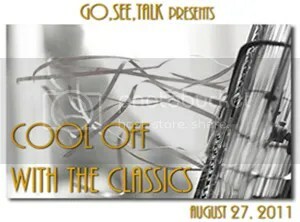 Marc from Go, See, Talk has done it again with another fantastic blogathon and you can see the original post linked to everyone else’s posts here. While some films came straight to my mind, I actually found it quite difficult to get to ten films without ending up with mainly Mae West and Marx Brothers films in the list. This has made me realise that I have a lot of films that I must watch! After making the list I got to thinking about how all of the films I have chosen have so many quotes that are still repeated and loved today. Is that due to the black and white look of the films or just how times have changed? Also performance wise just seems to be so much better than a lot of the current day films. For quite a few years now I have had problems buying DVDs of films which I have never seen before. These films may have one of my favorite actors in, won a lot of awards (mainly Oscar’s), I had heard a lot about the film or I missed it at the cinema. This is made more difficult when HMV, Asda and play.com all start selling DVDs for £2 or £3. This morning I decided to have a look and see how many of my DVDs that I have not ever watched . . . just the ones that I have never seen the film either. I have 30 of these DVDs and my plan is to watch them over the next few months. I probably have tried to watch a couple of them before but other than that they are films that I have never got round to seeing. I have decided that I am not going to buy any more DVDs of the films I have not yet seen until I start watching some of these which are just sitting around. That may encourage me to watch these a little faster. Here is the 30 long list of films I plan on watching over the next few months . . . or maybe longer I am not going to put a timescale on it but they are now top of my to see list. Why not? I have them ready to watch whenever I want. Marilyn Monroe is possibly still one of the most famous women in the world and seems that she will never go out of style or be forgotten. From acting to modelling. She was married three times, to James Dougherty then Joe DiMaggio and then to Arthur Miller. Alledged affairs with the Kennedys, including President John F. Kennedy whom it was rumoured that she was in love with. But also rumoured that she had affairs with Robert and Jack Kennedy. She was a very young 36 years old when she died, and her death was never really concluded. A few different options were given and suicide was one of them. I have to admit that I have not yet seen many of her movies, but I really do plan on trying to watch as many of them as possible. So far I have only seen two movies all the way through those are “All About Eve” and “There’s No Business Like Show Business”, I have seen bits and parts of some of her other movies but I am not counting that I have seen them as have not watched from start of finish. (Yes I know its shocking that I have no watched “Some Like It Hot” or “The Seven Year Itch” all the way through). But that is one of my goals to get to see her movies. Marilyn really does have some fantastic quotes which she said over the years and I love so many of them, mainly because I can relate and feel the same way about a lot of the things she has said. In some of the quotes she really does sound like she had to defend herself so much and really fight against everyone to show that she was a good actress. But I just think she really was something else, one of a kind and know one has ever come close to what she achieved in such a short time really in Hollywood terms from a young age. I saved my most favorite quote to post last, I really just think it is the best and think it describes myself. As the Oscars are in a week. I decided to look through my collection of DVDs and see which are Best Picture winners or have an acting Oscar associated with them. So I will try to review a lot of them over the next week. Re-watch and some of them even watch for the first time. As looking at a couple of them I haven’t actually watched them yet.